The city of San Francisco is considering further development of local ground-water resources as a supplemental source of water for potable or non-potable use. By the year 2010, further water demand is projected to exceed the delivery capacity of the existing supply system, from which San Francisco draws most of its water. The existing system is fed by surfacewater sources; thus, supplies are susceptible to drought conditions and damage to conveyance lines by earthquakes. The primary purpose of this study is to describe local geohydrology and water quality, and to estimate ground-water recharge in the area of the city of San Francisco. 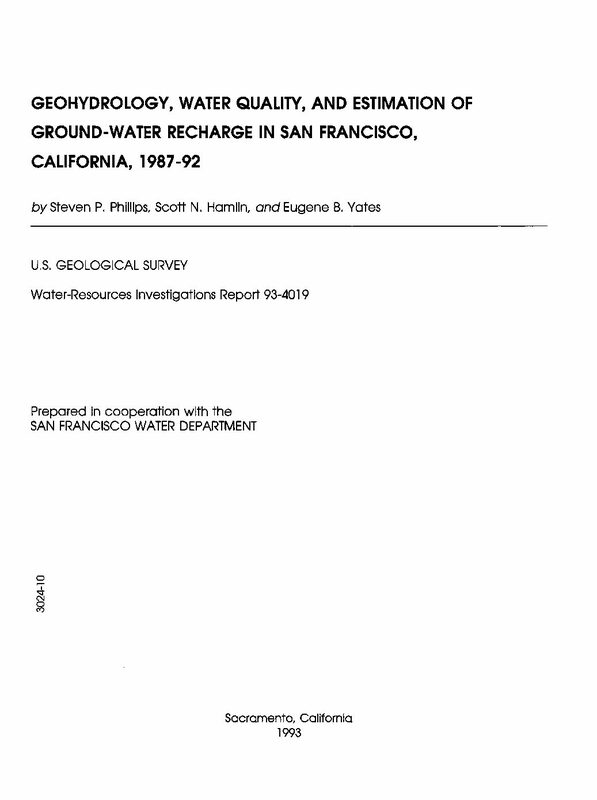 Seven ground-water basins were identified in San Francisco on the basis of geologic and geophysical data. Basins on the east side of the city are relatively thin and contain a greater percentage of fine-grained sediments than those on the west side. The relatively small capacity of the basins and greater potential for contamination from sewer sources may limit the potential for ground-water development on the east side. Basins on the west side of the city have a relatively large capacity and low density sewer network. Water-level data indicate that the southern part of the largest basin on the west side of the city (Westside basin) probably cannot accommodate additional ground-water development without adversely affecting water levels and water quality in Lake Merced; however, the remainder of the basin, which is largely undeveloped, could be developed further. A hydrologic routing model was developed for estimating ground-water recharge throughout San Francisco. The model takes into account climatic factors, land and water use, irrigation, leakage from underground pipes, rainfall runoff, evapotranspiration, and other factors associated with an urban environment. Results indicate that areal recharge rates for water years 1987-88 for the seven ground-water basins range from 0.32 to 0.78 foot per year. Recharge for the Westside basin was estimated at 0.51 foot per year. Average annual ground-water recharge represents the maximum annual long-term yield of the basin. Attainable yield may be less than the volume of ground-water recharge because interception of all discharge from the basin may not be feasible without inducing seawater intrusion or causing other undesirable effects.